We are pleased to announce that Justin O’Dell, a partner at O’Dell & O’Neal, P.C. 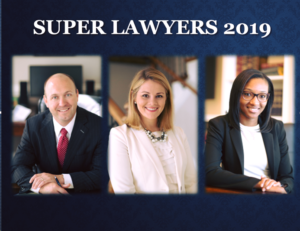 has been selected to the 2019 Georgia Super Lawyers list. This is an exclusive list, recognizing no more than five percent of attorneys in the state. Leslie O’Neal, partner at O’Dell & O’Neal, P.C. and Alyssa Blanchard, attorney at O’Dell & O’Neal, P.C. have been selected to the 2019 Georgia Rising Stars list. The Rising Stars list recognizes no more than 2.5 percent of attorneys in each state. Lawyers Digital Magazine. Please join us in congratulating Jane Smith on her selection.